Despite the lack of summer weather and with a definite chill in the air we made the most of our situation and had a great 2016 kickoff to Summer event anyway! Thanks to the facilities at the Carpentersville Middle School we were able to re-locate at the last minute and have the event indoors. After some mass last minute notifications everyone was updated and were able to make there way out for an entertaining evening. With great music in the background playing from the local middle school jazz bands, event goers were able to wander around and take in the displays and offerings from great local organizations who were showcasing summer family programs. A few refreshments and snacks made it a little more entertaining. All in all it went pretty well and everyone seem very well entertained! 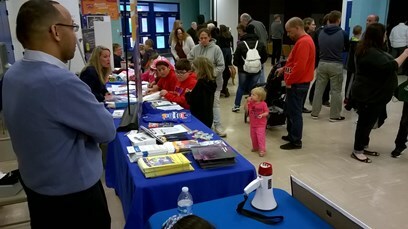 Thanks to all the middle school jazz bands for providing great entertainment, all the organizations who came out to support the event, the Carpentersville Police & Fire Department, all the volunteers who helped and all those who helped organize and make it a successful event for a 4th year in a row! See you next year! Check out the all the event photos in the 2016 Kickoff to Summer photo album!